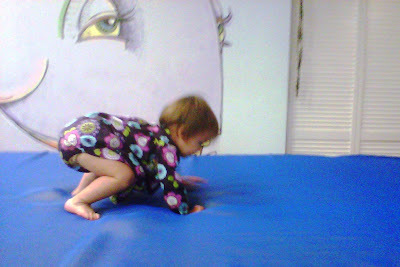 Last week was Hannah's first gymnastics/toddler tumbling class. I contemplated not taking her since she'd had the fever that weekend, but she seemed fine Monday morning so we went. This was probably a bad idea, and as a result, she was clingier than usual and a bit shy/overwhelmed, but with some support from Uncle Joel who got to come with us, she eventually warmed up and ended up having a lot of fun. Later on I worried that we'd infected the other kids but they were all there again yesterday so I guess not! Whew! 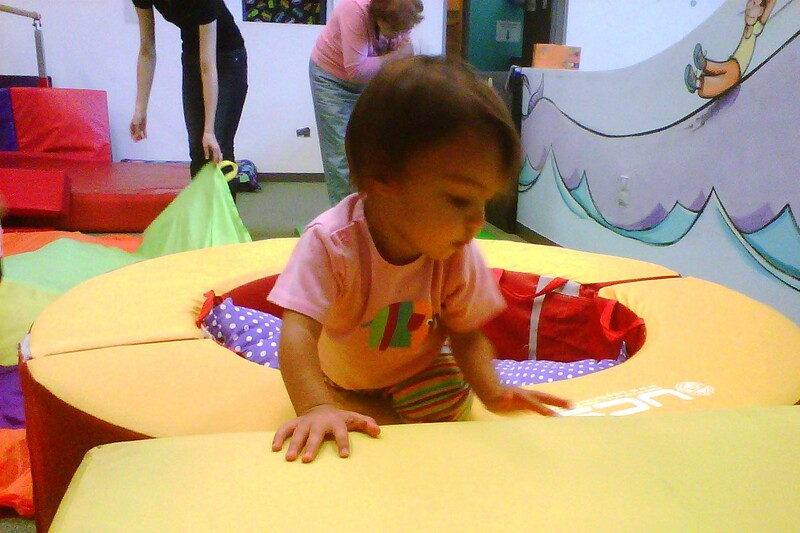 Classes are at Hoppin Tots Children's Gym. Back when I was a nanny, I took the boys to classes there and loved it. It was one of those things I made a mental note of for when I had kids of my own. This next part might be boring in which case, scroll right to the pictures, but for anyone interested in what class entails, keep reading for a description that is, as usual, unnecessarily lengthy and verbose (you know me). After practicing the skill of the day in the circle room, we move to the outer room where a new obstacle course is set up every week. The obstacle course encourages munchkins to climb up, over, through, and back down. There are sections of the course set up to work on the skill for the day, there's a balance beam (Hannah's not too interested in that), and there's a really cool bridge that is a big hit with all the kids and the only way I got her out of my arms in the first class. 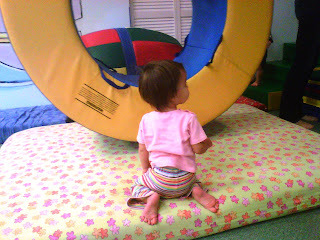 Parents are encouraged to help their munchkis through the course at least three times, and then we move into the free play room where the kids run around and do whatever they want. There's a giant foam mattress thing, tons of mats and soft squishy things, uneven bars, and the big trampoline I mentioned earlier. The teacher will bring out a game for the day for those kids who are interested (it was basketball the first week and giant foam blocks yesterday). (Hannah checked out each briefly but then quickly returned to the trampoline.) When that game is cleaned up, the teacher blows some bubbles and the kids run around popping them (except Hannah who stays on the trampoline). After bubbles the teacher breaks out the parachute. First the kids run around on top while the parents shake it to let air bubbles in, then the kids run around below while we lift it up and let it fall around them over and over again. Hannah showed no interest in this the first week but ran around beneath it like crazy yesterday. After parachute play we all sit in a circle and sing the "skinna-ma-rinky-dinky-dink, skinna-ma-rinky-do, I love you" song, get stamps on feet and and hands, and then say goodbye. Most of this program is exactly the same as when I used to take the boys I babysat so it's interesting to be experiencing it again with my own little munchkin. The other cool thing about Hoppin Tots is that they have two free play periods a week (Wednesday evening and Friday afternoon) where you can bring your kid to run around and expend some energy. It's free to anyone registered in the current session but it's got a cap on how many can come so you have to sign up ahead of time. For any kids not currently signed up, it's only $10. I'd like to recruit some mom friends to come with me some Friday afternoon. Anyone interested???? Hannah staring at a kid on the trampoline, probably willing him to get off it so she can have it to herself. Running around the giant foam mat thingy (this pic is from yesterday--the others are from last week). The trampoline is in a darker part of the room and with all the bouncing that goes on, it's impossible for me to get an even semi-worthy picture on my phone. I'll come clean about my mamarazzi tendencies in a future class so I can get some decent shots to share.